In my last post I wrote about those wonderful moments in which God feels so close that we can feel God’s presence in our bones. I also wrote that I thought the difference between us ordinary folk and the great saints is that for them the world is filled with burning bushes and the reality of God is transparently, perhaps blindingly clear. I have thought about that a little more. I have realized that that is not quite true. The great saints of the church often speak and write about another religious experience, often devastating, but no less real: a spiritual dryness in which God is nowhere to be found. I remember first waking up to the reality that the spiritual life is not always joyful or exciting. I have shared about the many years that I denied God and the joy of returning to a life of spirit and worship. I was so excited I was insufferable. I could not pass by a church without walking inside to see the sanctuary and spend time in prayer. On my days off I would visit Catholic churches, and would literally spend two and three hours in prayer. I was driving my wife a little crazy. Father Immanuel taught me something I had not known at that time: our relationship with God is exactly that: a relationship. It goes through the same kinds of phases that our human relationships go through. Just like falling in love with my wife, I had fallen in love with God. The first exciting flush of romance had come to an end. Now came the building of something with more substance, something enduring, something that required commitment, endurance, faithfulness. Both in my relationship with my wife and in my relationship with God, there are wonderful moments when romance is real, but there is something deeper that endures and is richer: real love, person to person, person for person. We’ve all known people who fall in love with love rather than with a person. When the initial flush of romance recedes, they begin to look elsewhere for that emotional high. Some people go from relationship to relationship, chasing that feeling, the excitement of romance. Sadly, they may never experience the beauty of mature love. Romance is fun, but real love, mature human love, is intended to be directed toward the person, not the emotional high of romance. Life, love, and faith all include harder, more difficult, and even tragic experiences. I am trying to rejoice and praise you in the midst of my difficulties and fears, but at the same time I don’t like it and I want everything to go back to how it used to be – When all was well with my world. Now my world and my future are different. I will live with cancer as a reality for the rest of my life. We know that these things are devastatingly real. We can wonder where God is in the middle of all of this. Some find God very close. For others, God seems distant, if not absent. We can feel angry at God, disappointed and even betrayed. For many, the reality of suffering makes belief in God difficult if not impossible. Mature faith, faith that endures, must somehow grapple with the reality of suffering, our own, and that of others. Mature faith even challenges us to embrace the suffering of others in the work to end it; there is where God’s love needs to be expressed and experienced most. The mystery we inhabit includes the reality that God does not protect us from suffering, but rather walks through it with us. It is often in suffering where God is most present, even when we are not able to see, feel, or sense it. Something deep in us and in our relationship with God changes when we discover God with us in the middle of the dark and even tragic experiences. Vivian wrote in her diary: “Jesus I cling to your cross – if this is your cross, let me take it joyfully and be worthy of the cross you have chosen for me.”  I don’t know that I have her vision or courage, but I hope I can learn from her, and others I have met like her. I do not consider myself to be anything close to saintly, or to be a model of the spiritual life. I am an ordinary pastor trying to be faithful and to serve the church. Please know that I do experience periods in my spiritual walk, sometimes extended periods, in which my prayer life feels dull and is difficult. It feels as if I am talking to myself. Studying scripture is dry. Church is good, but not terribly exciting. I would guess that those who read this know what I am talking about. Most of the great spiritual writers say that this is normal, to be expected, and is perhaps even an important experience through which we mature in faith and grow closer to God. Periods in which there are no burning bushes to be found, when God feels painfully absent, are woven into the texture of our spiritual lives. It is not God who disappears, but only our concepts and images, and sensations of God. This relinquishment occurs to rid us of our attachment to those idols and to make possible a realization of the true God who cannot be grasped by any thought or feeling. At the time though, it seems like abandonment or even betrayal. These periods of spiritual dryness are important to our spiritual maturity and growth. Old things must give way to new. They are times of purging and pruning. The same way caterpillars enter a chrysalis phase, and snakes shed their skins, to mature in faith we have to shed what no longer fits, to let go of some things we hold dear, to change. We cannot stay locked into the same images and experiences of God; God is more than all of them. We cannot cling to our feelings. We must learn to cling to God. Maturing is not always easy. What are we to do when we are experiencing spiritual dryness? Most recommend being gentle with ourselves. They advise not forcing ourselves to do more than we are able to, but to continue with our prayer, our worship, our work, and to trust that God is still present in us and to us. God is at work in the silence, deep within our spirits. Times of refreshment will return. The Christian contemplative, even when he fears that his prayer is hopelessly sterile and distracted, contradicts his own fears by the very intensity of the anguish by which he longs for God…Continue to seek God in love….and you will find Him. In these periods of dryness, more may be happening in us that we know. We may be maturing in our understanding of God. We may be letting go of older things that are no longer sufficient for us. God may be drawing us toward things that are deeper and richer. What counts, finally, is faithfulness and trust. Just as there is great beauty in human love that endures over a lifetime, so there is in a life of enduring faithfulness to God. I write this post to correct an overstatement that might lead people to think that the religious life is one of pursuing religious highs. Those experiences can be wonderful, but they are not what this faith walk is about. In the end it is about growing in the love and knowledge of the living God. It is about becoming fully alive and fully human. It is about learning how to love. And the path is not always easy. Felix, Richard, Rob Wilkins, The School of Dying Graces: Lessons on Living from Two Extraordinary Journeys Toward God. Tyndale House, 2004. 41. Felix, Richard, Rob Wilkins, The School of Dying Graces: Lessons on Living from Two Extraordinary Journeys Toward God. Tyndale House, 2004. 43. May, Gerald, A Psychiatrist Explores the Connection Between Darkness and Spiritual Growth: The Dark Night of the Soul, Harper, 2004. 146. Merton, Thomas, The Inner Experience: Notes on Contemplation, Harper, 2003. 102-3. This entry was posted in Faith, Journaling, Prayer and tagged Christianity, Discipleship, Gerald May, God, identity, Life Style, Mother Teresa, prayer, Religion and Spirituality, St. John of the Cross, Thomas Merton by revbillcook. Bookmark the permalink. Your thoughts on this subject are a breath of fresh air, Bill. Most of my walk, sad to say, has felt dry and sterile. I often wonder when my forty years in the desert will be done so that I can taste that sweet, living water again. Perhaps I’m just muddling some biblical metaphors there, but I’ve long wondered if God is breaking me down so that I can embrace him as the unique personality that he truly is, rather than strip mine him with prayer for all I can get. Not that I can add to or subtract anything from him – he’s God after all. But it seems I still have much about him to learn and experience. I’ve probably already established that i am not a religious man. But your posts always leave me reflecting on your words. I would admit that i am a spiritual person. But i prefer to leave it where it is. I understand the points you have made here. I think people who have done serious harm in their life seek faith for forgiveness. Others feel a need for faith as a form of security or even companionship. I feel quite the same way about my creative spirit. It’s a relationship that falls entirely into what you are saying. Would you say that art is a kind of faith, a kind of cocreation, the natural expression of the divine spark? Good question and something for a good and extended conversation. My opinion? Yes and no? I guess it depends on the content and intent of the artist. It is definitely not about speaking around “religious” stuff, or intending to be religious, or using god language. But rather around engaging life authentically. (I feel like I am going off a rather deep end here) I do think it is deeply spiritual, and co-creative. I do find good poetry more engaging than most of the popular books on theology and spirituality that I come across. Does that make any sense? It makes great good sense. I think the key is “engaging life authentically” (that’s good, Bill)… maybe we’re talking about transcendental vs. the dogmatic, spontaneous vs. contrived, right-brain vs. left-brain, spirit vs. belief, gut instinct vs. education. Okay … this would be a toughy to explore … you are probably more equiped than me to do this. Would be interesting to see you do a piece on this were you so inclined. I think art science and religion all intersect; in different ways each at its best is exploring the transcendent with awe and delight. Maybe that is what healthy spirituality is about? Maybe that is why people who are deeply engaged in any one of the three cannot help but say something about the other two? It is interesting that some theologians use the beauty of God as a point of departure (Balthashasur (I can never spell his name) and N.T. Wright), and some poets explore the nature of God and implications of faith, even though they state that they are not religious (Stephen Dunn), or are exploring their own faith (Milosz, Mary Oliver, T.S.Eliot). Rich to explore this. Probably easier in conversation than to try to write something solid around it. 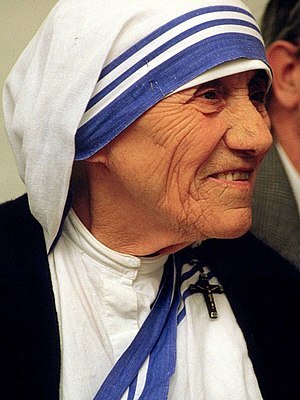 I love MOTHER TERESA…. am Hindu by religion but I believe deeply that GOD IS ONE WITH MANY FACES…. i loved your piece totally…. am trying to write on mother Teresa since long but couldn’t get enough to express so its still on my draft but your piece is so so beautiful; am sure itz way too beautiful then what i’ll write. One of many fabulous quotes by Mother Teresa. Excellent post, Bill. Through the years I’ve known many people who have fought and lost the battle with cancer. I have been privledged to be friends with three people of tremendous faith (one was a pastor’s wife, and leader of our healing minstry, also a theology student) and was blessed to watch such grace in the midst of uncertainty. Though I was saddened to lose such wonderful friends, I was comforted to know they felt at ease going home. St. John’s dark night. It comes to us all. Part of the growth. This is an important post, Bill. Thanks! This is the path of honor… I see you’re looking at Merton too. Good stuff. Have a great week, Bill. have fun today, thanks for linking .